Four-year-old Henry’s comment on the Slide Ride could just as easily apply to all the events during Dust Off Your Bike Week. There’s a lot of Bike Fun on the horizon with a couple of Poky Pedals scheduled this week. But I wanted to share some of the highlights from DOYB Week before the 2014 Bike Fun Calendar captures our full attention. Last Saturday was the Get That Darn Seat Adjusted Ride, the kickoff ride for DOYB Week. On a pleasant sunny morning, 11 of us met at Point Area Bicycle Service. John, the bicycle magician at PABS, made sure everyone had air in their tires, brakes that worked, and a comfortable seat position. While he was busy with that, we all enjoyed free coffee and donuts while chatting with each other. Once we were all set, we started off on a slow 5-mile ride on non-motorized paths and calm streets. Our loop passed by the Cultural Festival at SPASH, sneaking around the rear of the main building to avoid the busy parking area. Everyone enjoyed this relaxing ride on a beautiful morning. Sunday brought the Slide Ride for Kids. 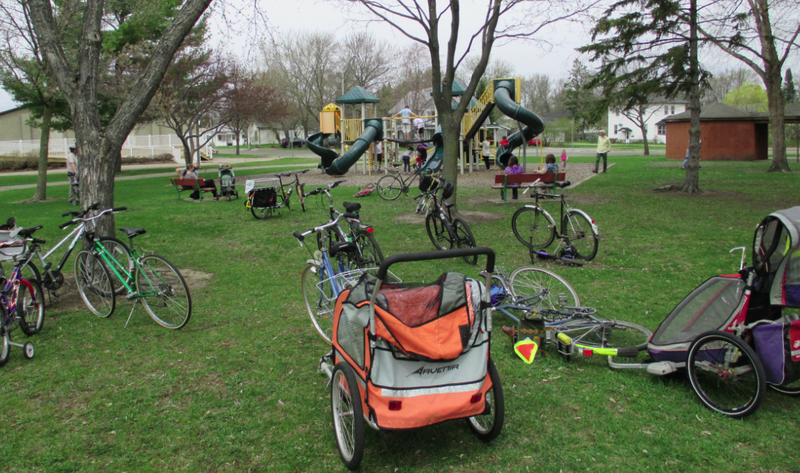 About 20 people, half adults and half kids, met at Pfiffner Park. Our 4-mile tour took us to slides at Pfiffner Park, Bukolt Park, Madison School, and the KASH playground at Mead Park. Although the afternoon was cloudy with a few sprinkles, the temperatures reached 70 – a rarity this spring – and it was a very comfortable day. All the kids had a great time, and I’m certain they would all agree with Henry’s assessment of the event. 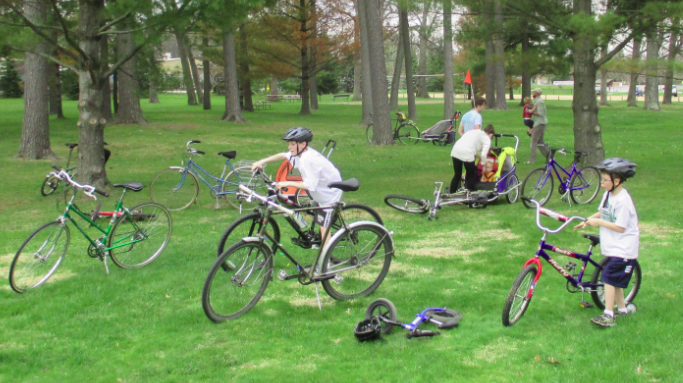 The adults also had a great time either watching kids or conversing with other adults on a variety of topics, including bikes and kid-carrying equipment. The Moonlight Ride was on Monday. I was at a meeting and could not attend, but I heard that despite the ominous threat of rain, 14 people met at PABS and rode out to Rusty’s Backwater Saloon where they hung out for a while. Their loop via W River Dr and Little Chicago Rd totaled about 16 miles. With the cloudy skies, I don’t think they saw much moonlight on the Moonlight Ride. Yet the rain stayed away, and it sounded like they all had a great time. Tuesday was the Fix-a-Flat class. 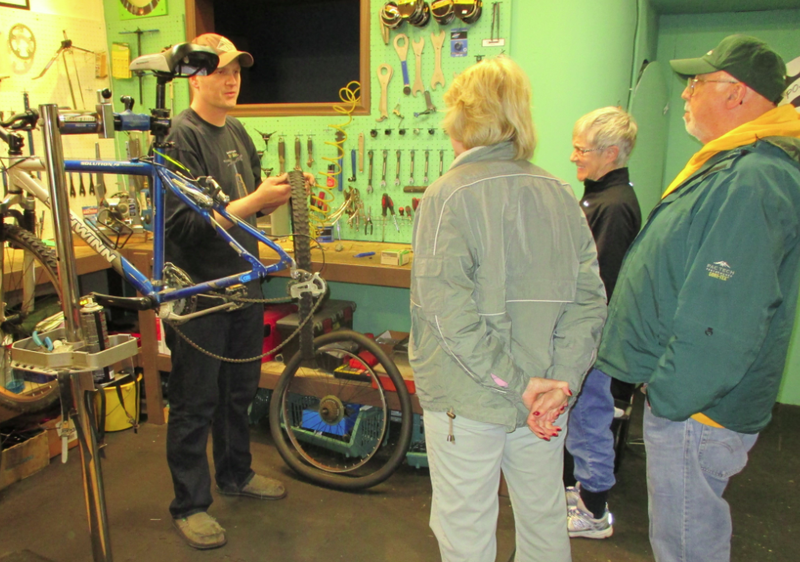 Four of us were treated to an informative demo by John from PABS showing the steps to follow for fixing a flat tire. He gave a bunch of tips for making the process easy and for avoiding common errors that often result in another puncture. Everyone enjoyed the class. 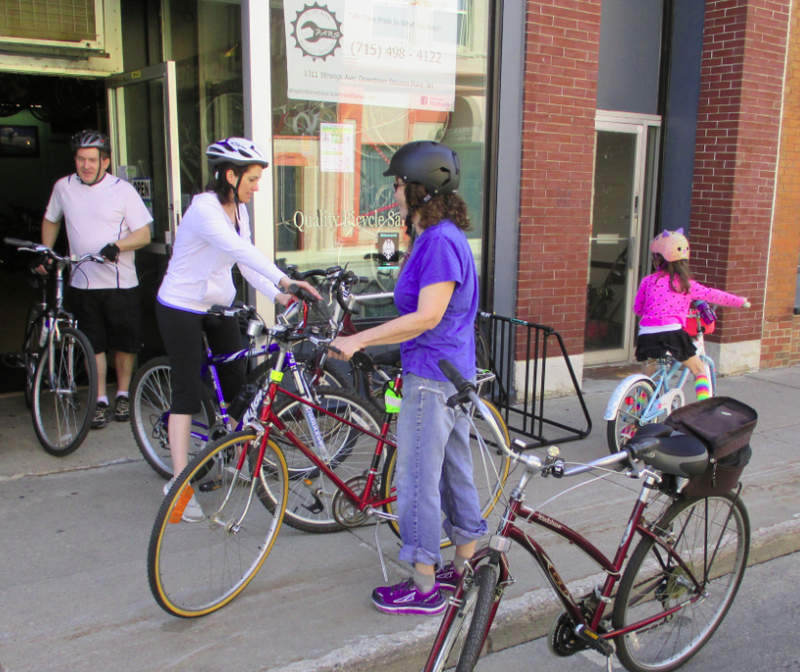 Wednesday was the Poky Pizza Pedal, the first Poky Pedal on the 2014 Bike Fun Calendar. I wrote all about it in this post, so I won’t repeat that here. I’ll simply mention that the 33 Poky Pedalers that rode bikes and ate pizza were the most ever for a Poky Pedal. We even got a short blurb with a picture on the front page of the Stevens Point Journal the next day. With the extraordinary amount of Bike Fun shared, it will be tough to top this Poky Pedal but I’m looking forward to that challenge. 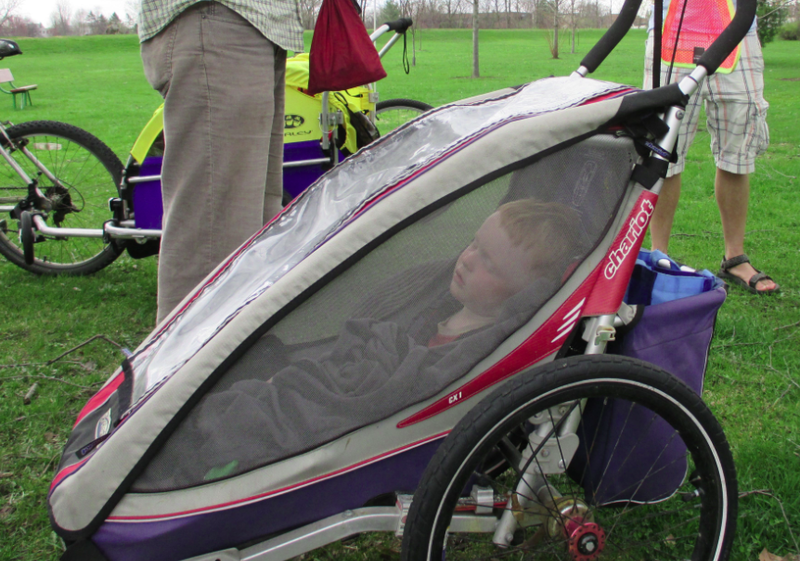 Resting up is a good idea because there’s a lot more Bike Fun ahead. The Average Jane/Joe Rural Road Ride was scheduled for Thursday, but our luck with weather ran out. A cold day with a strong wind deterred all but 3 of us. We decided it would be more fun to share some beverages inside than to brave the elements on our bikes outside, so that’s what we did. I want to thank John, Neil, Brad, and Mike for helping make Dust Off Your Bike Week so awesome. I’m thrilled that so many bikes are now dusted off and ready for all the Bike Fun ahead.